A new Tube Alarm app is set to arrive (on time) on the App Store and Android Market tomorrow in a bid to end your underground-related woes. Using tube updates from the Transport for London (TFL) website, you'll be awoken by a voice message notifying you of the delay on your favourite tube line as well as launching a music track from your device to get you up and into that bathroom. Information on delays and supsensions can be provided on your three favoured tube lines, letting you know whether you'll need to take a nother line, walk, or evem grab a Boris bike. Arkajit Bala a database architect from Wandsworth, South London, created the app after suffering a bad commute and explained how to utilize the Tube Alarm app, 'You can set it to go off maybe 30 minutes earlier if there are major delays on your line, and if there are minor delays you can set it to go off perhaps ten minutes earlier." 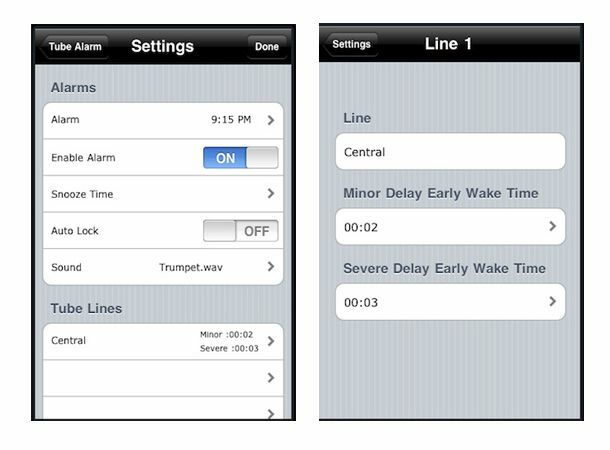 The Tube Alarm app launches tomorrow for the iPhone and Android devices, but you check it out on the App Store here now. A 'Tube Strike halt' update looks highly unlikely to be added to future versions.